Give in to the big, irresistible weekend breakfast smartly! Living healthy does not mean cutting out your favorite foods, especially not on lazy weekends. Staying at home with the family or going out to happy brunches with friends over the weekend, makes it impossible to stick to just a soup and salad. Weekend breakfasts all over the world, especially on Sundays, are all about gluttony in excess! Idlis, Aloo Parathas, Waffles, Pancakes, Eggs, Hash Browns, French Toast, Milkshakes, Cold Cuts, Danish pastries, Donuts, Peanut Butter and Jelly sandwiches, Muffins et al are all the foods we try and avoid all week in a bid to live healthier, but when the weekend rolls around, it is really hard not to give in and live a little. Just making small changes in your toppings, add-ons, cooking oils and portions can make your weekend indulgences feel lighter on your body, your inner health and your mind. Try these tricks on your next big weekend breakfast, at home or at a brunch. MAPLE SYRUP V/S HONEY – Drizzling raw, organic honey on your blueberry buttermilk pancake stack is a healthier option than the staple maple syrup. Also, peanut butter and jelly sandwiches can be made with organic peanut butter and raw honey. CINNAMON V/S ICING SUGAR – Sprinkling ground, organic cinnamon over your French toasts instead of icing sugar will help increase your metabolism and whittle down your waist. You can add cinnamon to hot coffees and teas too. UNSALTED COLD CUTS – Eating cold cuts that are not pre-salted will not only taste better, but also not make you feel bloated with unnecessary water retention after your meal. MILKSHAKES V/S FRESH JUICES – Milkshakes are awesome undeniably, but so are slow-pressed fresh fruit juices. Slow pressed juices retain a high percentage of the fruit’s nutritive values and are as good as eating the fruit itself. And whilst milkshakes fill you up with added sugar and milk, fruit juices don’t. HALVING DONUTS / MUFFINS / DANISHES – Eating donuts, muffins and Danish pastries is heavenly, but halving all these delights will give you as much joy and satisfaction as having all of them whole. Isn’t that smarter? COOKING MEDIUMS – If you are cooking at home, switch to healthier oils like Olive Oil, Organic Desi Ghee and Mustard Oil to minimizer the cholesterol level of the foods in the cooking process itself. Not only will your Parathas, Hash Browns and Idlis taste better, but will feel lighter on your digestive system too. ORGANIC BUTTER V/S SALTED BUTTER – The main difference between organic butter and salted butter is shelf life – organic butter has a short shelf life and salted butter can stay in your fridge for weeks on. 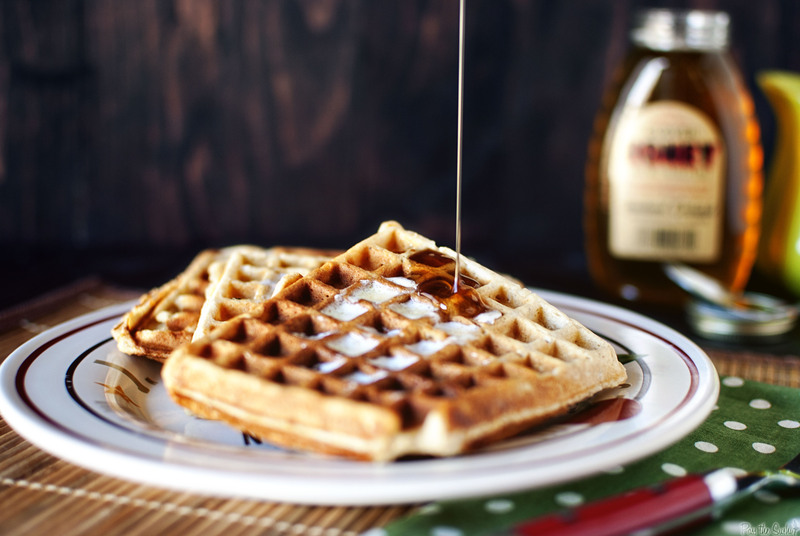 Organic butter is a smarter choice when making Waffles and Pancakes at home. COOKING METHODS – Whenever possible, eating poached or boiled eggs is definitely healthier, but if you like your eggs sunny side up and scrambled, then organically farmed eggs is the way to go. So it is quite simple really to shake off some of the bad calories with some organic, natural good on your plate. What’s life really without foods that taste so good, right? So, go on indulge yourself without any regrets! Categories: Natural Mantra, Organic Living, Sustainable Living | Tags: Blueberry Pancakes, breakfast, Idlis, Olive Oil, Organic Butter, organic honey, Organic Peanut Butter, Parathas, Raw Honey, Waffles | Permalink.